At Universal Subsea, our mission is to be a leading advocate in the offshore industry for safe and reliable subsea equipment design, manufacture, and operation. The deep ocean setting for subsea oil and gas wells is a hostile environment that can cause extensive damage to multi-million dollar subsea equipment due to corrosion, calcareous deposits, and marine growth. 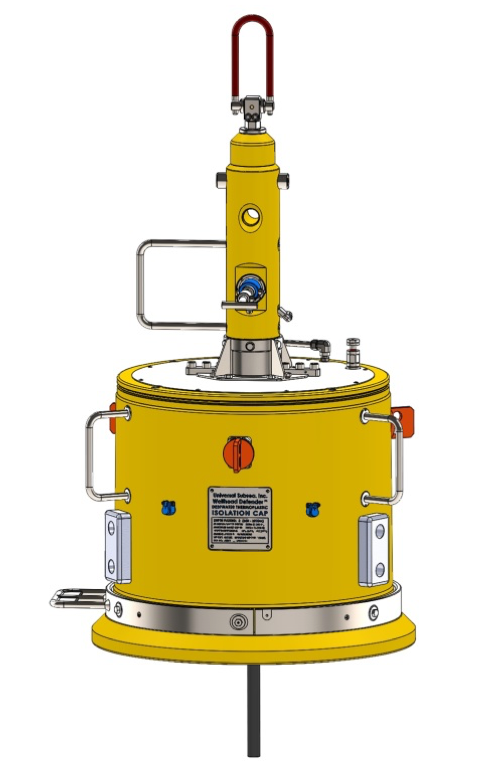 Wellhead Defender Subsea Isolation Cap on H-4 Wellhead Test Fixture (multiple patents pending) ©2019 Universal Subsea, Inc. All Rights Reserved. Universal Subsea’s advanced thermoplastic subsea isolation cap for subsea wellheads and subsea tree mandrels is the first protector cap to completely isolate the mandrel and internal bore from the subsea environment. This unique protector cap utilizes thick wall plastic molding technology to provide space for oversized proprietary body seals which reliably seal very large gaps to the mandrel. The special body seals effectively contain preservation fluids at low pressures while ensuring low installation forces for ROV deployment and retrieval. The heavy duty ROV operated locking system ensures that the cap is positively locked to the mandrel while ensuring low risk of damage to the wellhead and the cap. Defender Stasis LT Subsea Equipment Preservation Fluid (patented product) ©2019 Universal Subsea, Inc. All Rights Reserved. 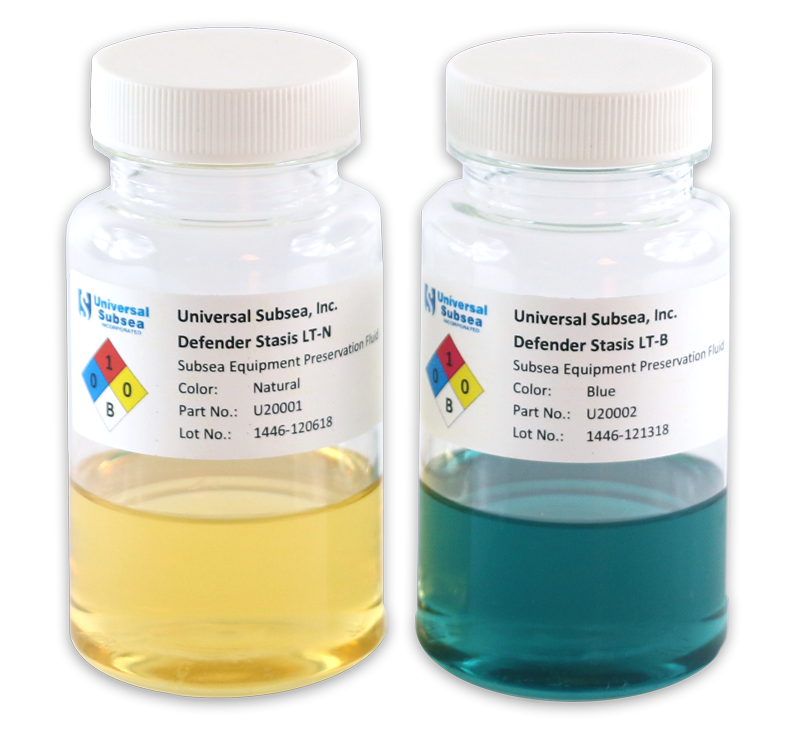 Universal Subsea’s nontoxic, biodegradable preservation fluid provides superior corrosion protection for subsea equipment in the marine environment. The fluid is formulated as a Total Loss Lubricant so that it can be released directly to the environment for discharges subsea, offshore, in coastal waters, inland waters or on land. Defender Stasis LT is also ideal for a wide range of other applications to protect subsea equipment and tools. USI’s deepwater thermoplastic subsea protector cap for new subsea wellhead installations and existing temporarily abandoned project wellheads. Completely isolates the subsea wellhead bore, VX ring gasket profile, and H-4 profile from the marine environment, thereby halting all corrosion, mineral deposits, and marine growth. 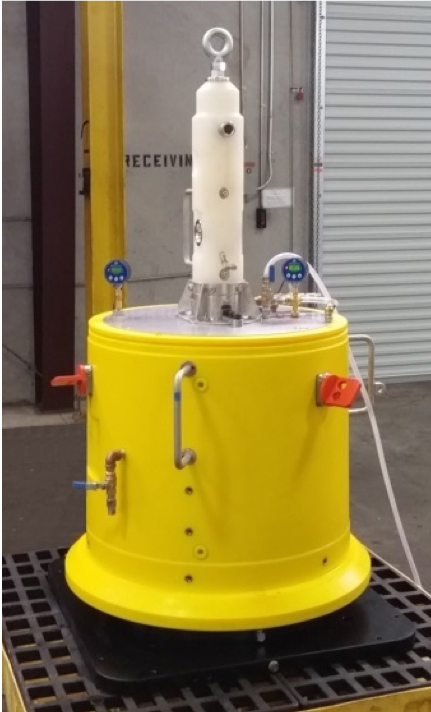 Models: All subsea wellheads with 27” H-4 profile. Other sizes and models available upon special request. USI’s environmentally friendly subsea equipment preservation was developed primarily to provide protection for subsea wellheads and subsea tree mandrels in the deepwater marine environment. The fluid is ideal for a wide range of equipment preservation applications to protect subsea equipment internals during shipping, storage and wet parking applications, in additional to running tools and other uses topsides on the rig or installation vessel. Defender Stasis LT provides a long shelf life and operating life (over 3 years) but biodegrades rapidly if released to the environment (over 60% in 28 days). The fluid provides the lowest possible environmental impact in the event of planned, unplanned, or incidental discharges. USI’s deepwater thermoplastic subsea protector cap for new subsea tree installations and existing subsea trees. Completely isolates the subsea tree mandrel upper bore, VX ring gasket profile and H-4 profile from the marine environment, thereby halting all corrosion, mineral deposits, and marine growth. Models: Most subsea trees with 27” H-4 profile (GE Vetco Gray, Aker, etc.) ). Isolation cap for EVDT Vertical Subsea Trees under development. Consult USI to review your specific subsea tree application. Other isolation cap models available upon special request. Subject Matter Experts with expertise in subsea equipment specification, selection, design, engineering, manufacture, operation, and reliability. Please contact us at Universal Subsea, Inc. for additional information.